WHY BE IN A WRITING GROUP? Who else understands what it's like to be a writer? Who else can offer encouragement, support, critiques, ideas, a shoulder to cry on if you need it? If you have a family or spouse who ask you when you're going to get a real job, or who respond to your writing with comments such as "Hmm, interesting" or "That's nice", maybe you need to join a writing group! You need to find a group where the writers are on your wavelength. They might be writing similar things to you (there are groups that only workshop poetry or crime fiction or children's fiction, for example), or you might decide you want a women's group. You might want a group that offers good critiquing or workshopping. Or you might want a group that is more social and just enjoys sharing their work. Ask yourself - what do I really want or need from a group? Then see if you can find one that suits. Don't be afraid to leave a group if it's not what you're looking for. But be polite about it. WHAT IF YOU CAN'T FIND THE GROUP YOU WANT? How about forming one of your own? You'd be amazed how many people are looking for a group to join but can't find one in their area, or one that offers what they need. Put a notice up at your local library and bookshops. Put a notice in your local newspaper if it has a free community section. Think about where you could meet. Do you want people coming to your home? Maybe you could investigate the local neighbourhood centre. They will probably charge room hire but split between a few people it would only cost you a few dollars each. Ask the library - many have free meeting rooms. You could start by organising a first meeting of interested writers. When they come along, ask them to say what they are looking for. If everyone is honest, you will probably end up with a group that wants to workshop each other's writing. Be aware that the members will need to build up a relationship of trust, so that you can all comment honestly. Part of that trust is that comments also be constructive, not destructive. Discuss this openly with each other so everyone knows the expectations. It's true. In virtually every class, seminar, writing group or committee, there's always one difficult person. The degree of difficulty can range from rude comments or taking offence at critiquing suggestions through to abrasive personality clashes and downright destructiveness. Sometimes the group can gently help the person to realise that their behaviour is disruptive and they'll either leave or change their ways. But sometimes it might come down to asking the person to leave - it's awful to experience but the alternative is usually that the group will not survive. Members gradually find excuses to leave and the group dwindles away to nothing. We've been going for 20 years. What's our secret? All of us are serious about getting published. We're also serious about supporting each other as much as possible, through constructive workshopping, sharing information and celebrating successes. Anyone we know who has been or is in a great writing group will agree - it keeps you going when you most need support and inspiration, provides editorial help to get you published, and the members of the group truly understand about things like rejection blues, unsympathetic family, writer's block and the need for a space of your own. 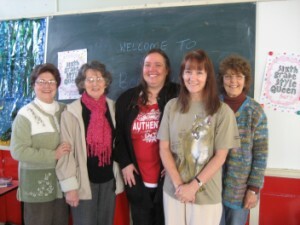 L to R: Lorraine, Margaret, Tracey, Sherryl, Lynette - a few Western Women Writers!